Do you have vintage linens that have been handed down to you or that you’ve found in thrifting adventures, but are stored away in a cupboard? Think about making them into easy cafe-styled curtains which transform these treasures into something functional and also allows you to enjoy their beauty and uniqueness on a daily basis. 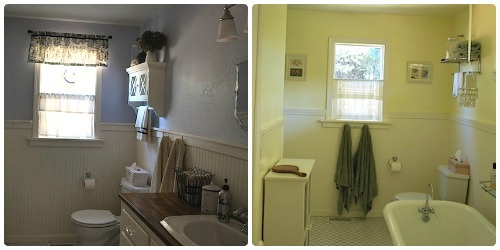 When we remodeled our bathrooms, we replaced the dated, foggy windows with clear single-hung versions since we wanted to maximize the natural light in the rooms. 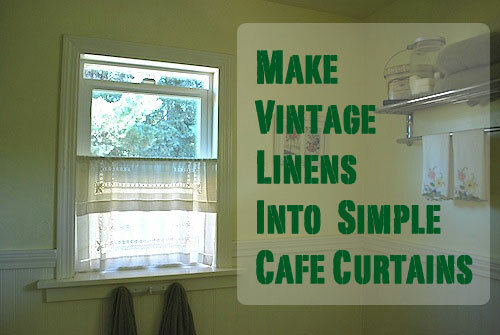 Cafe curtains were an easy solution for both bathroom windows – they provide privacy, but still let in light above the curtain. 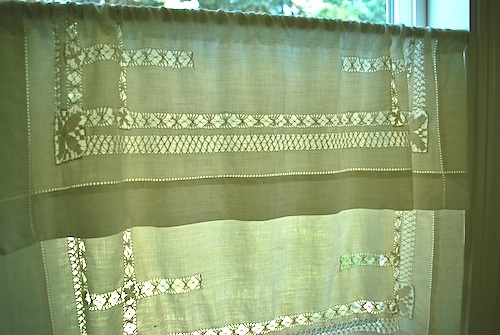 With nothing but a single line of straight-stitching, I was able to use two pieces of vintage linen – one a pulled-thread cotton and the other a hemstitched pure linen – to create one-of-a-kind curtains. 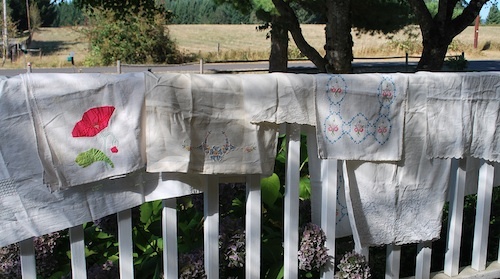 Vintage tea towel, small tablecloth, runners, napkins, etc. Measure your window. The width is the most important part, but you’ll also want to know how much length you’ll want from your rod to the window sill. Choose a vintage linen piece that fits your measurements. 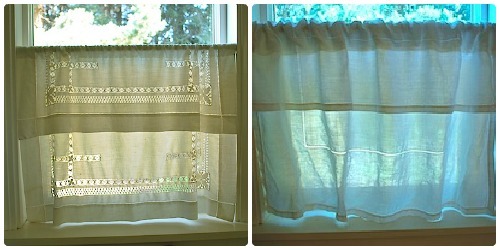 For the simplest curtains, choose pieces that fit perfectly the width and have only enough over-hang to create a self-valance for the height (as pictured above). Measure your rod width to know how wide to make the pocket for the rod on the curtain (1-inch will usually cover most cafe-sized rods for smaller windows). a) Simply fold over the end of the linen piece, mark where your pocket seam should be to create a pocket the width you need (based on your rod measurements) and sew a loose (set the machine stitch to 3.5 or by hand) seam straight across at the mark. b) Cut the linen, leaving enough to make your pocket and fold a raw edge under – sewing as above. I chose to simply fold over the linens for both our curtains not only because it was simple, but also because I didn’t want to cut into the linens. This way, if I want to do something else with them, I can simply use a seam ripper to remove the stitching, wash and iron them and they will be back to their original states. More or less. 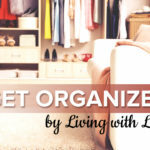 However, what if you have a wonderfully embroidered tablecloth you’d like to use, but the decoration is only in a corner and it’s way too long? This is a case where you’d want to cut and add a side-hem as well as a rod-pocket. The point is to use these wonderful pieces that may have a special history for us or that we want to showcase as a way to honor our heritage as creative women. Some of these techniques like the drawn-thread-work piece on the left above are simply not produced by hand anymore. Or at least not very often. And they are amazingly well done. Let’s bring them into the light once again. 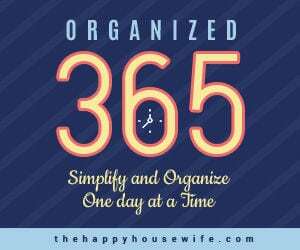 Do you have vintage linens stored away? How do you like to use them? That is a nice idea, but here is one that makes it much more easier…. I love and agree w what you say about honoring these pieces. I also use the little clips…although, when hung like that, the fabric does not cover where the tiny suction cup meets the window edgel….but the suction cup and window ledge are both white so it’s ok. The clips are kind of nice and retro too. I have also made the sew rod channel (esp for larger windows…does look nice!